SAR Executive Director Rob Quinn will speak alongside SAR scholars at an educational briefing for Congressional staffers. Open to the public. 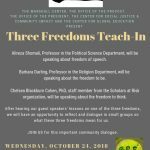 Join us for this campus wide Teach-In where three guest speakers will be providing lessons on one of the three freedoms.